This Question is also Helpful For GATE and other Examination . Pattern is the model of casting. It is made of wood, metal or plastics. Mould is produced in moulding sand by using pattern. 2. List out the various pattern materials. 3. What are the advantages of using wood as pattern material? 1. Wood is cheap and easily available. 2. It is easy to cut for making required shape. 3. It can be easily handled as it is light weight. 4. What are the advantages of using aluminium as pattern material? 1. Metal pattern is strong. The life and dimensional accuracy of the metal pattern is more. 2. Change in shape does not occur due to moisture. 3. It can be used in machine moulding. 4. It is suitable for mass production. 5. Metal surface can be finished smoothly and hence very good impression of the pattern can be obtained in the mould. 5. List out the factors for selecting pattern material. 1. Number of castings to be produced. 2. Quality of the casting. 3. Size and shape of the casting. 4. The method of moulding and casting. 5. Required surface finishing of casting. 6. Required accuracy of casting. 6. What are the types of pattern? 7. What is the use of dowel pin? Split pattern is usually made of two parts. One part will make the lower half of the mould and the other part will make the upper half of the mould. These two parts are fitted correctly by dowel pins. 8. What is the need of loose piece pattern? Some patterns cannot be removed from the mould as single piece. So loose piece patterns are used with the solid pattern for the easy removal. 9. What are the pattern making allowances? 10. What is shrinkage allowance? The molten metal in the mould will cool and become solid. The metal will shrink and reduce in size during cooling. The pattern is made larger than the required size of the casting to compensate this metal shrinkage. This is called shrinkage allowance. 11. What is draft allowance? The edges of the mould may be damaged when the pattern is removed from the mould. This can be avoided by making the vertical surfaces of the pattern with slight taper. This taper is called draft allowance. 12. List out the various moulding tools? 13. List out the uses of rammer, trowel and slick. 1) Rammer is used for packing or ramming the moulding sand in the moulding box. 2) Trowel is used to smoothen the mould surface and to repair the damaged portions of the mould. 3) Slick is used for finishing mould surfaces and for repairing the round corners of the mould. 14. Give the uses of lifter, sprue pin and strike off bar. 1) Lifter is used to remove the loose sand from the mould and to repair the broken surfaces of the mould. 2) Sprue pin is used for making holes for runner and riser in the mould. 3) Strike of bar is used for removing excess sand from the mould after ramming. 15. What are the uses of swab, gate cutter and draw spike? 1) It is used for applying small amount of water around the pattern before removing it from the mould. 2) It is used for cutting gate in the mould. 3) It is used for removing the pattern from the mould. 16. What are cope and drag? 17. List out the various binders used in moulding sand? Give an example. b) Organic binders : Wood, resin, linseed oil and dextrin. 18. List out the properties of moulding sand. 19. What are the types of moulding sand? 20. What are the elements in gating system? 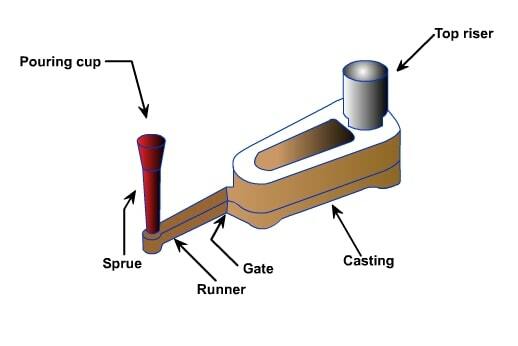 1) Pouring cup 2) Sprue 3) Runner 5) Gate 6) Riser. 21. What is the function of riser? After the mould is filled up, the molten metal rises into the riser. It supplies molten metal to the mould during shrinkage of casting and thus correct size casting can be obtained. 22. What are the types of moulding? 23. What are the advantages of dry sand moulding? 1) It is stronger than green sand mould. 2) It is not damaged while handling. 4) Smooth surface finish can be obtained. 5) Casting defects like blow holes will not occur. 24. State the applications of loam moulding and pit moulding. Loam mould is used for producing large castings like cylinders, bells, gears and machine parts. Pit moulding is used for producing castings which cannot be produced in moulding box. 25. List out the types of moulding machines. 26. What is core and core print? Core is used to make hollow or a hole in a casting. A projection made in the pattern is called core print. It is used to form a core seat in the mould. The core is correctly seated in this seat. 27. List out the types of core boxes. 28. What are the essential qualities of core sand? 29. List out the core binders. Give an example. 30. List out the steps in core making. 31. What are the types of cores? 32. List out the ovens used for heating the core. 34. What are the different micro structures of steel? 35. What is iron-carbon equilibrium diagram? Iron – carbon equilibrium diagram is the graphical representation of the phase changes undergone by iron with respect to the carbon content and temperature on cooling or heating. This diagram is drawn by taking the carbon content in X-axis and temperature in Y-axis. 36. What is hypo eutectoid steel and hyper eutectoid steel? Steel containing carbon less than 0.8% is called hypo eutectoid steel. Steel containing carbon exactly 0.8% is called eutectoid steel. Steel containing carbon from 0.8% to 2% is called hyper eutectoid steel. 37. What are uses of tap hole and tuyers in cupola furnace? Tap hole is provided for taking out the molten metal. Air for combustion of fuel is sent through the openings called tuyers. 38. List out the furnaces used for melting of non-ferrous metals. 39. Mention the furnaces used melting of steel. 40. List out the various casting processes. 41. What are the applications of pressure die casting? Carburetor body, crank case, fuel pump parts, sound horn and wiper can be produced by pressure die casting. It can also be used for producing toys, cameras, clocks and washing machine parts. 42. Mention the applications of centrifugal casting. The castings like water pipes, gun barrels, fly wheel, bush bearings, gears, brake drum etc. are produced by centrifugal casting. 43. What are the applications of chilled casting and malleable casting? Chilled casting is used for producing railway brake shoes, wheel rims, crusher jaws, machine slide ways, etc. Malleable casting is used for producing wagon wheel hub, door hinges, pipe fittings, locks, levers, cranks, and textile machine parts. 44. List out the various defects in casting? Read more ; What are the Casting Defects ? 45. What are the causes for blow holes? 1. Excessive moisture in the sand. 46. What is swells and shift? Swells : Enlargement of casting surface. Shifts : Misalignment of casting sections. 47. What is cold shuts and hot tears? Cold shuts : Incomplete filling of mould cavity. Hot tears : Internal or external dis-continuity in the casting. 48. What is fins and run out? Fins : Thin projection on parting line. Run out : Leakage of metal from the mould.